Patlabor is an older concept than most people think. In the very early 1980's, Masami Yuuki would regularly have coffee with his friend and fellow manga artist Tomato Aki to discuss the state of robot anime at that time. The most popular series during that period was "Mobile Suit Gundam", conceived by Yoshiyuki Tomino. Tomino was notorious for killing off major characters and having lots of angst in his anime (see "Aura Battler Dunbine" and "Space Runaway Ideon" for the most extreme examples of this). Yuuki wanted to get away from that style of robot anime completely. He and Aki wanted a story where robots were used in everyday life, a more realistic story. A story where the characters didn't have to die and teenagers full of angst didn't populate the story. 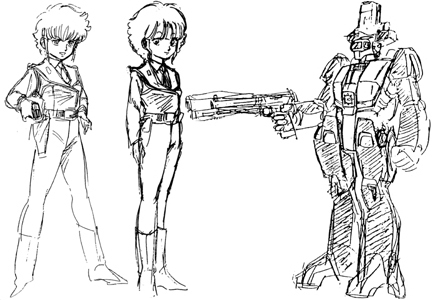 Below are three TV series concepts thought up by Masami Yuuki and the people who later joined him to flesh out his idea (whom most of became the core of Headgear), and show the development of what would eventually become Patlabor. They provide a great insight of how Patlabor might have turned out to be if things had gone a little differently. The first concept they came up with was "Jeilazard". It told the story of an interstellar war and was set on a training ship. The lead character was a girl, which wasn't the usual protagonist seen in an anime of that time. In retrospect the plot outline sounds very similar to "Gunbuster (Aim for the Top! )", Gainax's 1988 OVA (direct to video) series. The "Jeilazard" concept was not pitched to any studios, nor was it fully developed. The next concept is getting towards Patlabor, but it's still set in space. The plot goes like this; sometime in the future in the far reaches of the solar system, other worlds are being colonised, and people are being drawn toward this new frontier. Unfortunately there is a labour shortage. Luckily there are people who will take on any sort of challenge. One of them is a girl called Aldy Rime of Rime Active Services, a small company that takes on any job no matter how tough. She has a friend and counsellor named Ban, who is the manager of a Casino. Other characters include a mechanic named Derek and a cute girl named Alpina. There were a number of mecha in the show, Garrakres, a giant robot (which looks a bit like Optimus Prime from "Transformers"), Haigari, a space craft and Jackgari a land vehicle. The show was going to be a light comedy. The outline of the story sounds like a mix of "Dirty Pair" and "Crusher Joe". Again this concept was not pitched to any studio. Masami Yuuki ditched the concept completely when he discovered that the name of the show sounded a bit too similar to Walker Gallia, a robot in "Sento Mecha Xabungle", a robot show which debuted on Japanese TV in 1982. 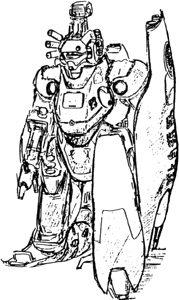 A sketch of Aldy Rime in a pilot suit, very reminiscent of the ones seen in "Mobile Suit Gundam", and a rough sketch of Garrakres, the main robot of the show. 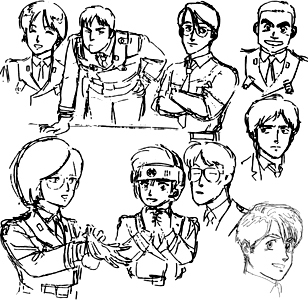 Sketches of the "Lighting Garrakres" cast. 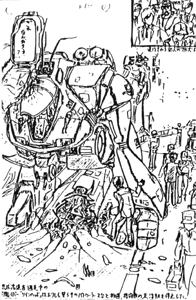 The "Vidor" concept was pretty much Patlabor set in space. Most the core concepts from this show would be later used to develop Patlabor. "Vidor" takes place sometime in the future on a colonised planet, where large humanoid robots called 'Labors' are used for heavy work. However these Labors are being used by criminals to commit crime, and a new Labor police division is formed to fight this crime. A young police woman named Aldy Rime (a character recycled from "Lightning Garrakres") has just been transferred to this new division in the POPS 110 Precent. The division uses a robot called Vidor mainly for traffic control and to fight Labor crime. Other team members include another young woman named Epiluna Micro. The Vidor Labor is a controlled by two pilots; Aldy and Epiluna. The main duties of of the division are traffic control which is a major problem on the planet. The tag line of the show was going to be "Space is Jammed!". There is also a shadowy organization called Falcone Shaft, controlled by a middle aged megalomaniac named Charles Michael von le Falcone. His subordinates include his calm and cool assistant Shiriaru do Shiba, Shiba's subordinate Nick Jagger who is one nasty customer, and Hermes who is a clever and dexterous criminal, and is named after the Greek patron god of thieves. Hermes was going to be a Lupin III type of character. Masami Yuuki said in an interview that Aldy was much rougher than Noa Izumi, and more like Kei from "Dirty Pair" with an appetite for mass destruction to boot. 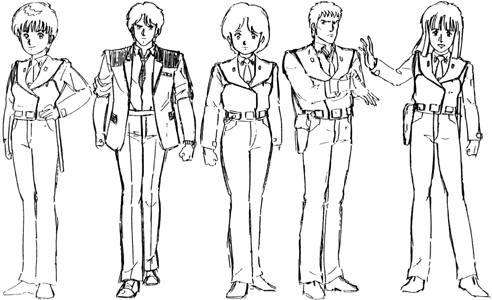 The uniform designs are very similar to the final Patlabor designs (which are based off "Ultraseven" team member costumes), but they seem to be a bit more influenced by "Mobile Suit Gundam", especially with the footwear. Around 1985, Yuuki met up with Yutaka Izubuchi who was working in the editorial department of Animec magazine. Izubuchi fell in love with Yuuki's concept. Along with sci-fi novelist Kou Hiura, the small team set about writing up a proposal for a 26 episode TV series. Also created at the same time was a dummy proposal named "Galdeen". The main reason behind this was that the studio that they wanted to pitch it to, Sunrise, said they they'd rather hear two pitches for story ideas at a time. However Sunrise unfortunately rejected both project ideas. From left right, Aldy Rime, Epiluna Micro and very sketchy and a rough drawing of the main Labor robot, Vidor. From left to right we have an unnamed child character (perhaps a young Aldy Rime), an unnamed POPS 110 Precent team member, Hermes, and Charles Michael von le Falcone. "Vidor" cast height comparison model sheet. The team are modelled from Tsuburaya science fiction shows such as "Ultraseven". This influence can also be seen in the final Patlabor character designs. At this point, the project languished somewhat as Yuuki focused on his manga serial "Ultimate Superman R" which soon became a fan favourite. But soon Izubuchi met screenwriter Kazunori Ito. 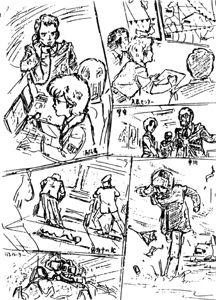 Ito also liked the idea and began re-working "Vidor" into what was to become "Patlabor", and began to include more common everyday elements to the sci-fi storyline. Eventually the show's setting became near future Tokyo after a devastating earthquake. 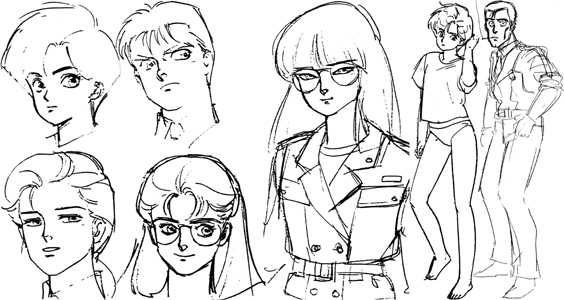 At the same time Ito's wife, Akemi Takada, joined the small team re-working Yuuki's character designs. 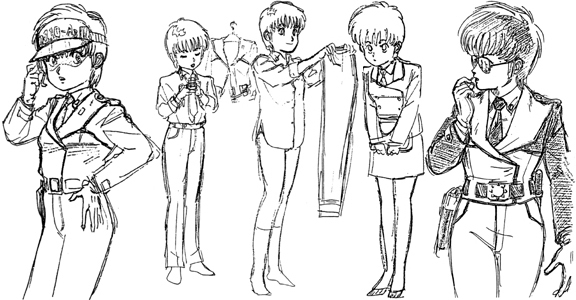 In 1986, an acquaintance of Ito's at Bandai Visual noticed the popularity of Yuuki's work and offered the small team a chance to make "Patlabor" as an OVA as long as Yuuki produced a manga version as a tie in. With that agreed to, it was decided to produce the OVA series as an actual production company, so that Yuuki, Ito, Takada and Izubuchi owned the rights to the series. The only problem was that they needed a director to complete the package. From the beginning Mamoru Oshii was a candidate, but members of the team were rather sceptical that he could work on a realistic sci-fi show because of his previous work. But eventually those fears were quelled and in December 1986, Headgear signed an agreement to produce a six part "Patlabor" OVA series. The development of Noa Izumi by Masami Yuuki. 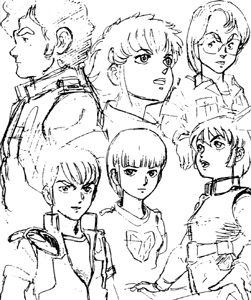 Some of these sketches date back as far as 1983, but oddly look more like the Noa we see in Patlabor rather than Aldy Rime in Vidor. After Vidor, the character was named Celia Saotome for a short time. 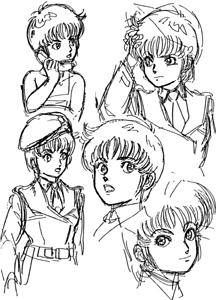 Character studies of Celia Saotome (early version of Noa Izumi) by Masami Yuuki. 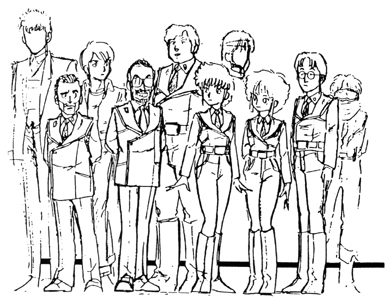 Tomato Aki's version of the Patlabor cast circa 1985. At this stage the characters that would eventually become Noa and Kanuka seem to more or less set in stone, but the others are still far off the final designs. 1985 character studies. By now we are seeing Shinshi, Hiromi and Kanuka developing quite well, however Asuma looks rather more handsome and dependable than his final design. Note that by this early stage, the distinctive helmet that the Patlabor pilots wear is more or less at its final design stage. 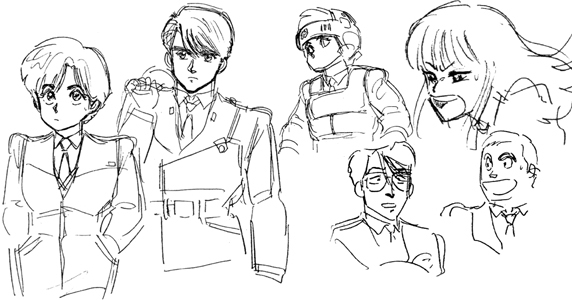 Another set of 1985 character studies. As well as Noa and Shinshi we can see Ota and Shinobu developing. Other characters remain totally unrecognisable when compared with the final designs. 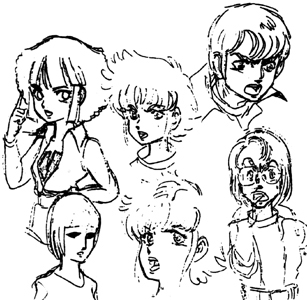 Character designs by Akemi Takada drawn in 1985. Noa, Asuma and Shinobu are pretty much complete. But Kanuka has gone through a couple of changes as you can see from an early head shot, to the middle drawing where she has more distinct Asian features. Also pictured here are two full length body drawings of Noa and Gotoh. 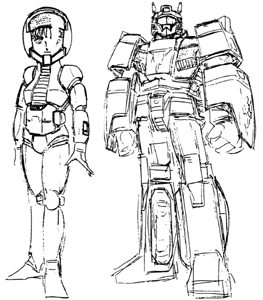 On the left is an early version of a Patlabor, though you can see elements of the Ingram in the design. Also pictured is very early image boards which are designed to show action sequences.